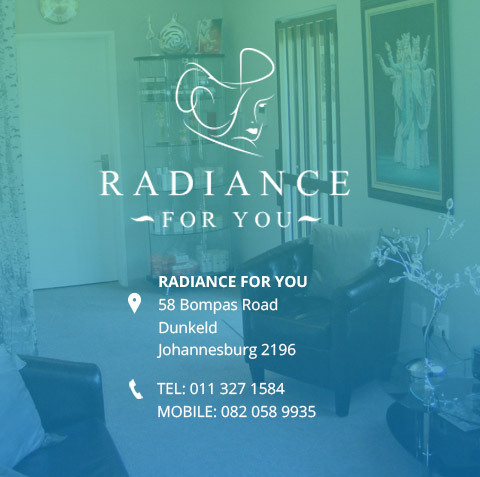 Facial ageing and wrinkles can be treated here in Joburg. “Nature gives you the face you have at twenty; it is up to you to merit the face you have at fifty”. The human face is important for many reasons, the most important being it displays our emotional status. People read each other’s facial expressions to understand what they are feeling. The face has been called the “organ of emotion” and, is perhaps the most powerful form of nonverbal communication. Our characteristics and personality can be seen in our features and they form part of who we are as individuals. The face also plays a role in physical attractiveness; people put plenty of time and effort into maintaining and enhancing their facial appearance because it is the focus point during social interaction. The mechanisms of facial ageing are complex. Ageing occurs at different rates in different individuals. During the course of the ageing process the general outline of the face changes from a triangle with the apex pointing downward to a trapezoid or rectangle, due to sagging skin, and the downward descent of the cheek soft tissues. This change in geometry is more evident in the female face. As we age we lose collagen and elastin from the skin of the face. Skin elasticity decreases and the skin becomes thinner. Lifestyle choices such as diet and sun exposure impact the rate at which these factors come into play. Areas with a thin epidermis (eyes and lips) become wrinkled first. The main component of collagen is Hyaluronic acid (HA). Every 10 years we lose 6% of endogenous HA. For many years it was thought that the human face aged uniformly. We now know that fat disappears from different fat compartments in the face at differing rates. 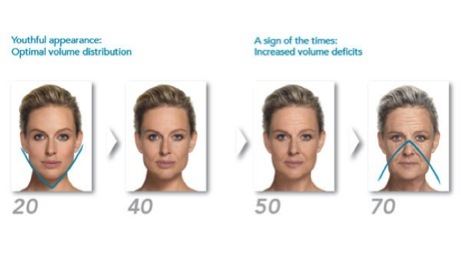 Most cosmetic doctors now agree that the rate of fat disappearance is directly related to how the face ages. Facial bones lose density and thickness. This causes some minor changes in facial shape. What is commonly seen is the loss of bone along the bony rim under the eye and in the region of the nose-cheek junction. The remaining upper and lower jawbones do not change as long as the teeth remain intact. Superficial skin ageing starts from the age of 20 and progresses with the time. The number of skin cells reduces and as a result the skin loses its resilience, tensile strength, recoil capacity and elasticity. The skin also appears less bright, and firm. Folds, fine lines and wrinkles appear. The wrinkles are the earliest and the most visible signs of skin ageing. They start to develop on the face, neck and hands, especially those areas which are photo exposed. This is a complex biophysical process which results from progressive structural and biochemical alterations of the skin with impaired mechanical properties resulting in wrinkles and jowls being visible on the face. These are due to muscle motion and are referred to as dynamic wrinkles. The wrinkles that are merely due to ageing of the skin are referred to as dynamic wrinkles. Collagen levels also start to fall, sometimes resulting in crow’s feet and frown lines. Fat begins to disappear from under the eyes and dark shadows cause us to look older and tired. There is little effect of bone loss seen in this age group so no correction is needed. During this time the skin ages even more. The epidermis (outer layer of the skin) begins to thin and becomes irregular. There is increased water loss from the skin and a decrease in the function of the sebaceous glands, which provide natural moisture to the skin. Sun damage to the skin causes an increase in elastin that clusters into thick bundles, called elastosis. During this period of life there is an increase in skin irregularities (see Skin Irregularities) and we see on the skin new growths or hyperpigmentation. Photo ageing can also cause chronic inflammation of the skin. 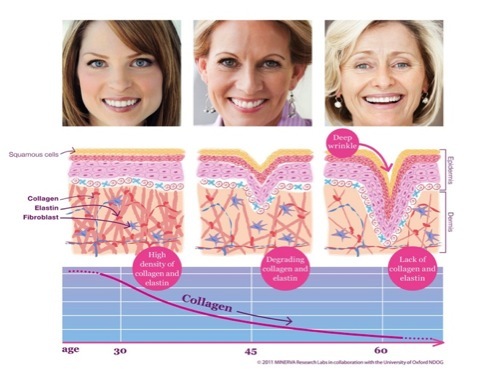 Collagen levels continue to fall resulting in decreasing skin turgor and the skin becomes looser. We see, the beginnings of brow drooping and the appearance of the nasolabial folds (the lines from the nose to the mouth). The base of nose gets bigger and some changes can be seen in chin area. To correct this we can enhance facial contours with hyaluronic acid to change the nasolabial lines and the marionette lines (the lines from the corners of the mouth down to your chin). The lips also begin to get thinner. Glabella (frown lines between the eyebrows) and forehead wrinkles appear. With advanced filling techniques we tend to look at changes that occur in the mid face and lower face. To correct this we can apply Botulinum Toxin A to most of upper face and also to elevate eyebrows, Laser/Light Therapy and Mesotherapy is used to correct skin laxity. Collagen and elastin levels continue to fall resulting in eyelid bags and lines start to appear in upper and lower lips (see more on Lip Ageing). The forehead wrinkles deepen. Nasolabial lines deepen. Gravity and the pull of muscles cause drooping or sagging of the skin. Facial fat atrophy or wasting becomes evident with concavity of the surface contour being seen in the temple area as well as the cheeks. The cheeks begin to flatten and the Malar fat pad descent becomes more obvious. In some individuals the eyes become sunken rather than forming eyelid bags as a result of fat atrophy. Marionette lines and jowls now appear more pronounced and a double chin appears. The Chin area continues to enlarge. Eye sockets begin to widen. Menopausal effects in women result in the skin becoming more fragile and delicate, and therefore prone to redness and broken capillaries (IPL). Oestogen controls microcirculation, and the lower oestrogen level decreases blood flow to the skin, we see a thinning of the epidermis and a slower cell turnover rate. The skin barrier function also decreases, leading to increased trans-epidermal water loss and dry skin on the face, neck and hands. (Treatments offered Mesotherapy, Meso-needling/Dermal Needling). Blotches and uneven skin tone are also characteristic of this phase in a woman’s life. Because of low oestrogen levels subcutaneous fat tends to decrease and be redistributed. The skin’s underlying support structure increasingly disappears. Oestrogen is very important in regulation for pigment production in the dermis so as it decreases we see hyperpigmentation and age spots on the face, neck, arms and chest. (See more on Hyperpigmentation). Fat also begins to hang unsupported in saggy skin. The nasolabial and marionette lines substantially, if not corrected. (Recommended treatment: Injectable Fillers) Neck wrinkles appear more noticeable; more eyebrow drooping is evident and the nasal tip also droops. The lips get thinner and there is less dry vermillion (pink area where lipstick is applied) showing. Perioral wrinkles (smokers’ lines) deepen. Platysmal bands (“turkey neck”) appear. Correction: Hyaluronic Acid fillers to upper lip. Botox begins to have a diminishing effect. Face lift, Brow lift, Blepharoplasty or Neck lift often required. Bone density gets less because of reduced growth hormone and oestrogen levels.